Happy First Anniversary, Middletown Location! Time flies when you're having fun! We're celebrating our 1 year anniversary at the Middletown location. Thank you to all of our amazing employees and clients for an incredible year! In June 2017, we officially opened La Belle Studio's second location. Later that month, we were honored to have a Ribbon Cutting with the Middletown Chamber of Commerce. It was a fantastic moment for the La Belle team. If you haven't had the opportunity to check out the Middletown location yet, and meet our team, we've got a couple great reasons to stop in! La Belle Studio Middletown Grand Opening, June 30, 2017. Not one, but two La Belle Lash Artists were recently promoted! Congrats to Chelsea's promotion to Master Artist, and Kelly's Promotion to Senior Artist! And in honor of Kelly's promotion to Senior Artist, we're offering 20% off of her full sets during the month of June. This offer is only available at the Middletown location and you must mention this special when booking with Kelly. 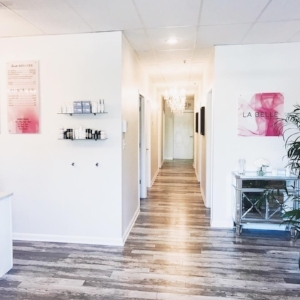 If you missed out on our first Dermaplaning Event, please join us June 23 when we'll be hosting our second Dermaplaning Event at BOTH locations (Middletown and Trolley Square). For more info, head over to our Facebook Events Page. To book your appointment, call (302)378-8880 for Middletown, (302) 656-0555 for Wilmington. La Belle Studio commemorates their second location with a ribbon cutting and weekly blog launch, plus preps for a July 15 grand opening event.